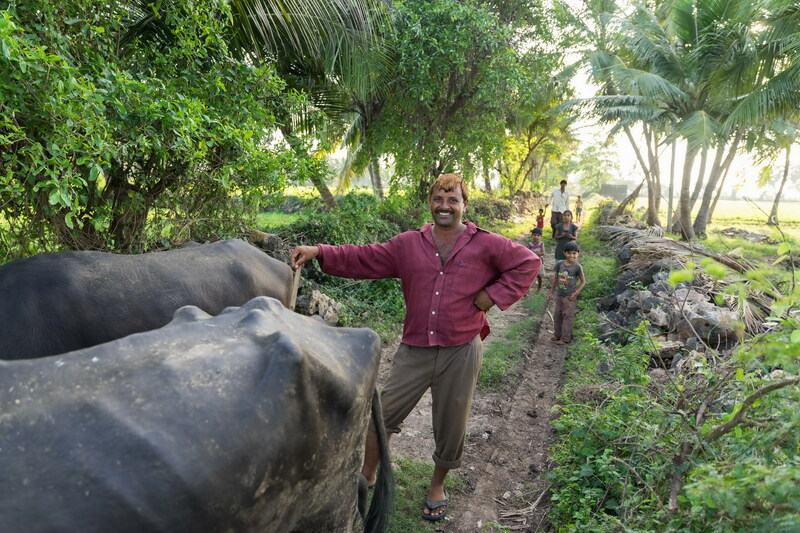 Agriculture & Food Security - The Network works in over 2,800 villages across Bihar, Gujarat, Madhya Pradesh and Uttar Pradesh and has helped improve the quality of life for over 1.6 million people in these states. In April 2015 AKF started an organic cotton project in the Nimar region of Madhya Pradesh with the support of the C&A Foundation. Manga fills here his distributer with Panch Patti, a natural pest repellent made from five leaves found locally. 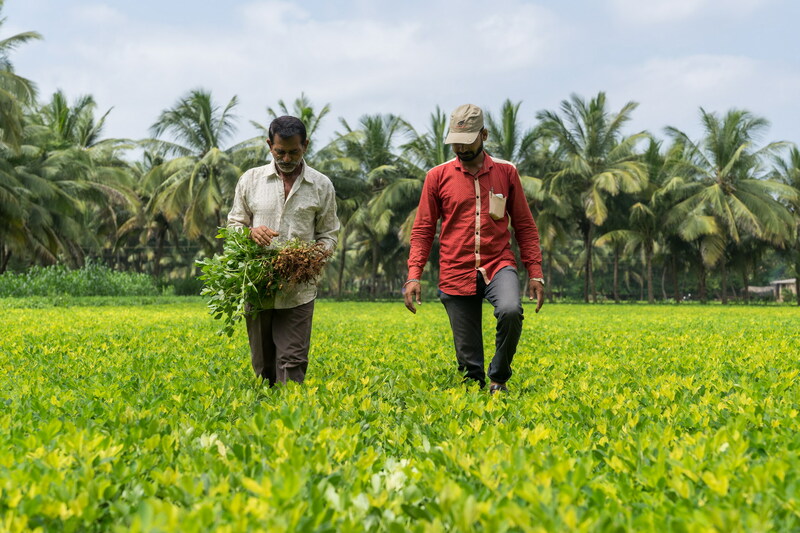 Combined with cow dung, cow urine and water the extract is left to ferment for 8-10 days and can then be sprayed on cotton plants as well as vegetables, herbs and pulses intercropped. In April 2015 AKF started an organic cotton project in the Nimar region of Madhya Pradesh with the support of the C&A Foundation. The project aims to improve the livelihoods and incomes of 7,000 tribal farmers living there through the promotion of organic cotton cultivation. 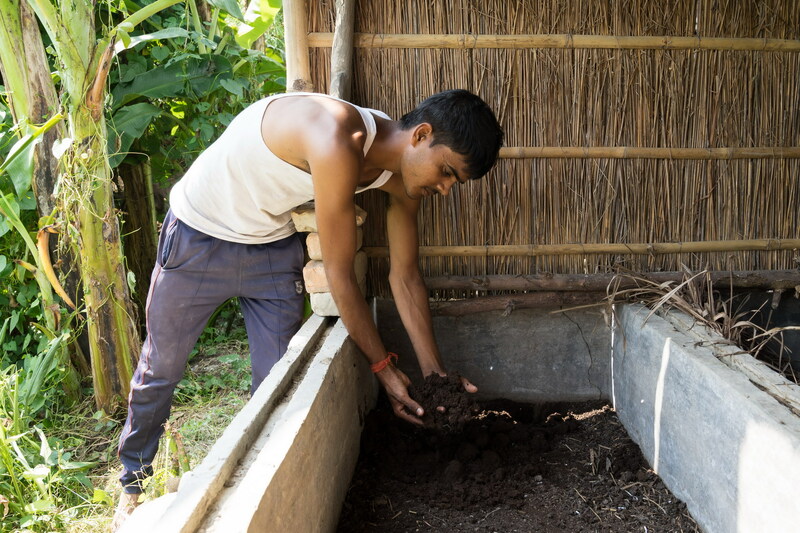 Vermi-composting is one of the agricultural enhancement techniques promoted by the Aga Khan Rural Support Programme (AKRSP). Muzaffarpur, Bihar, India. 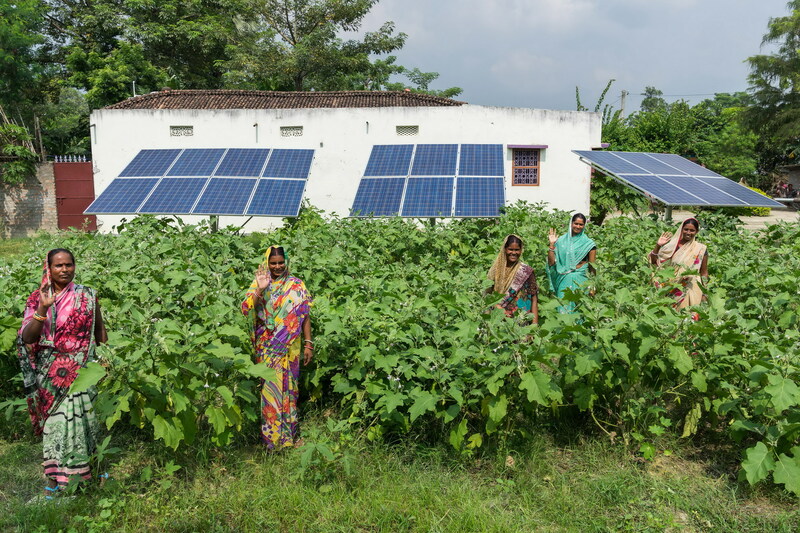 The Self Help Group-run solar powered irrigation scheme in Muzaffarpur, Bihar, India was set up in April 2016 with the support of the Aga Khan Rural Support Programme (AKRSP). The scheme is run by 12 SHG members. In India, The Aga Khan Foundation (AKF) and its sister agency, the Aga Khan Rural Support Programme, India (AKRSP (I)) focus on supporting marginalised communities’ economic development and environmental protection through community-based approaches to natural resource management (NRM) and livelihood enhancement at the village level. Particular focus is also put on facilitating wider learning and outreach at state and national levels. The programme currently works in over 2,800 villages, directly benefiting almost 1.6 million people, in the states of Bihar, Gujarat, Madhya Pradesh and Uttar Pradesh. In Netrang, Gujarat, government provides subsidised cows and buffalos to tribal villagers; AKRSP provides technical input for breeding and market linkages for dairy products that increase the beneficiaries’ incomes. Community engagement and mobilisation are central to the Aga Khan Foundation (AKF)’s approach to ensuring local ownership and the sustainability of programme interventions. In India, AKF and the Aga Khan Rural Support Programme, India (AKRSP (I)) focus on developing and strengthening sustainable community institutions, and federating these groups, so that they are better able to connect with local government programmes to access entitlements and public services. To date, 5,000 village-level institutions, representing over 100,000 people have been supported in Gujarat, Madhya Pradesh and Bihar. These institutions play a major role in mobilising communities for planning, implementation and monitoring of initiatives in agriculture, watershed development, irrigation management, horticulture, and dairy development. The local institutions operate at sub-village, village and block levels, with AKF/AKRSP (I) providing technical and institutional capacity building support as well as strengthening relationships with government line departments, panchayats (the Indian term for local self-government) and in some cases, with financial services providers and agricultural input suppliers/traders. Most of the communities in the Aga Khan Foundation (AKF) and the Aga Khan Rural Support Programme, India (AKRSP (I)) programme areas are heavily reliant on agriculture as a result AKF’s efforts to improve households’ economic conditions are focused on increasing productivity and diversity, and on strengthening connections to agricultural traders and processors. These interventions enable poor smallholders to sell more, higher quality produce at increased prices therefore helping ensure food security, increase net incomes, help with climate change mitigation and adaptation and reduce risks for farmers. Agriculture/Natural Resource Management (NRM) interventions address a wide range of staple crops (rice, wheat, pulses), cash crops such as cotton, high value horticulture, as well as livestock. In each of these sub-sectors, AKF/AKRSP (I) work to improve input supply through the introduction of new seed varieties/breeds and easy to make organic, low-cost fertilisers and pesticides as well as improving soil and water management. In Gujarat, AKRSP has been working in drought-prone areas some of which are also prone to coastal salination for over 30 years and today some of AKRSP (I)’s programme areas are extremely water-stressed making water conservation and community-based irrigation approaches key to sustaining agricultural production. AKF/AKRSP (I) also work to set-up farmer producer groups and help them negotiate growing and purchasing agreements with agro-input suppliers and processors. AKRSP (I) has had significant success with the System of Rice Intensification (SRI), which increases productivity by improving the management of soil, water, plants and nutrients. Yields have increased by up to 50% with SRI, allowing farmers to allocate more land to valuable cash crops such as cotton. Farmers have replicated SRI principles for other crops such as maize and wheat with significant improvements in productivity. In 2015, as part of its work to improve farmers’ livelihoods, AKF and AKRSP began a better cotton initiative with farmers in Gujarat as well as an organic cotton project in Madhya Pradesh. A farmer who benefited from a spreading canal maintained by the Aga Khan Rural Support Programme (AKRSP) promoted federation, Maha Sangh. Mangrol block, Junagadh block, Gujarat, India. 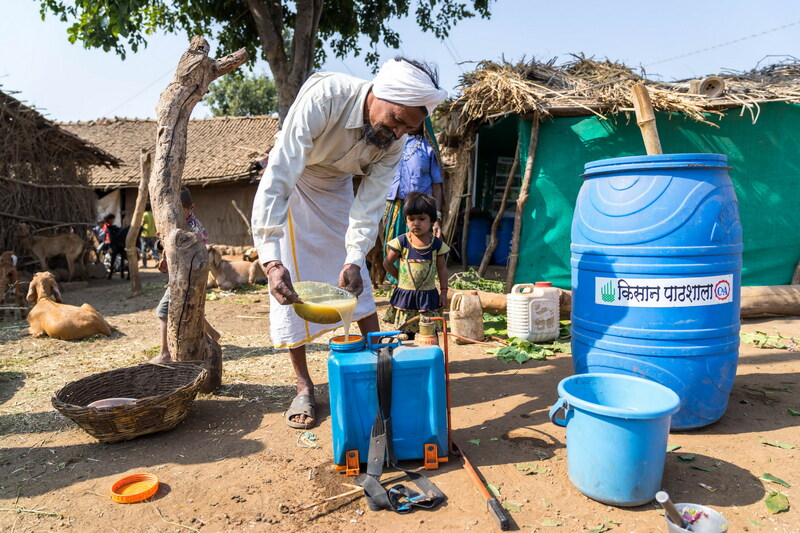 In Gujarat, AKF and AKRSP are helping small farmers adopt water use efficiency measure by adopting drip irrigation and as well is working to help farmers access government subsidies for these technologies. In Madhya Pradesh, farmers are being supported as they move towards sustainable organic cotton farming and better markets. Since 2002, some 20,000 households have benefitted from irrigation schemes and 40,000 from soil and water conservation measures in Gujarat and Madhya Pradesh. 48,301 hectares of land has benefited from watershed development and an additional 15,000 hectares irrigated through development of wells, farm ponds, rehabilitation of canals and associated works. On average, incomes have doubled as a result: farmers now earn US$ 1,000 annually compared to US$ 500 in 2001. Forestry is another means of improving the livelihoods of farming communities. AKRSP has been helping reignite the traditions of community protection of common lands, which have come under pressure due to lack of entitlements and population growth. Through farm forestry efforts and reforestation efforts in southern Gujarat and Madhya Pradesh, AKRSP has helped communities reduce the drudgery for women and children, improve their local ecology and contribute to reforestation efforts. Livestock is an essential asset for the poorest households with limited access to land or other productive assets and interventions focus on training to improve animal husbandry, improving access to veterinary services, and establishing linkages to local dairies. Goat-rearing in Madhya Pradesh and Uttar Pradesh is helping families earn up to US$ 500 extra per year. A key component has been the promotion of women animal health workers called “pashu sakhis”, who provide affordable animal care in remote villages. Pashu Sakhis are now being trained in Bihar, as part of a wider women’s empowerment programme which is building the capacity of women self-help group (SHG) members to adopt modern veterinary practices with small ruminants as well as become para-vets themselves. AKF/AKRSP (I) activities in agriculture/NRM reach more than 1m people (28% female) and are increasingly supported by state funding and grants from local corporate trusts and foundations.